BHEL Engineering Trainee, Executive Trainee Recruitment Exam-2019: Bharat Heavy Electronics Ltd invites online applications from the Engineering Graduates, CA/ICWA and MBA or PG with HRM/IR/Social Work/Personnel Management/Labour Welfare for the available Engineering Trainee and Executive Trainee (HR/Finance) jobs. There are total 145 posts in this BHEL Recruitment 2019. Apply online for this BHEL Engineering Trainee recruitment 2019 from 16-04-2019 to 06-05-2019. 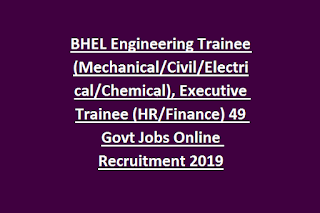 Official website to apply online for this Engineering Trainee BHEL Recruitment 2019 is www.BHELexams.in. In this notification we are also attaching the syllabus pdf for this BHEL Executive Trainee, Engineering Trainee jobs. Detailed information about this BHEL Engineering Trainee vacancy details, qualification, age limits, exam pattern and syllabus and other details are updated below. 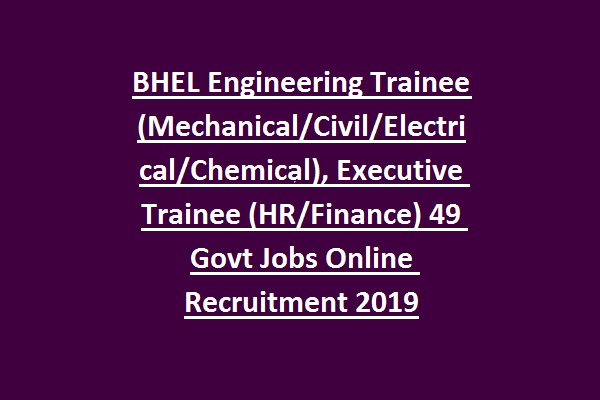 There are total 49 posts in this BHEL Engineering Trainee jobs recruitment 2019. For Engineering Trainee Posts: 27 years for Graduates and 29 years for PG qualification having candidates. For Executive Trainee Jobs: upper age limit is 29 years. For Engineering Trainee-Engineering Degree in relevant discipline. M.E or M.Tech qualified candidates are also considered. An objective type written exam is conducted for BHEL ET Recruitment 2019. A short list will be prepared based on candidates marks in written exam. Apply online for this BHEL ET Recruitment 2019. Last date to apply online for these Engineering/Executive Trainee vacancies is 06-05-2019. Official website to apply online is https://careers.bhel.in/. Hall Ticket for this BHEL ET Recruitment will be released one week before the exam date.